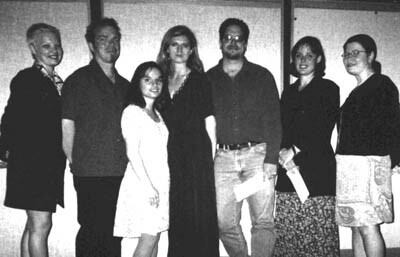 Scholarship recipients, members and guests traveled to Old Town Pasadena for a "summer reading"-themed scholarship event on June 10, 2000. The program featured introductions of scholarship recipients and presentation of awards by scholarship chairman David Larson, followed by an introduction and excerpt presentation from a new novel by ASFLA president Jim Koenig. Participants enjoyed beverages and grazed from a table ladened with goodies provided by the board of directors as classical guitar music filled the community room of the landmark South Pasadena Public Library. Nanna Mailand-Hansen, American Film Institute Center for Advanced Film and Television Studies -- Producing Fellow, Citizen of Denmark: Producer Kim Magnusson says, "During her stay with us, Nanna often rose above and beyond the call of duty. She is very resourceful and competent, and has a great personality. Her drive and ambition for the projects on which she worked was outstanding." Eric Davin Noreen, Cal State Los Angeles -- Senior Geology, Swedish Heritage: Winner of a drawing for a trip to Sweden held in conjunction with an exhibit on Sweden at the California Museum of Science and Industry a teenager, Eric hopes to, "return once again, as I am doing independent research in glaciation within Scandinavia. Soon, I hope to return to Scandinavia to find the truths within my research as well as within myself." His professors affirm his ability to realize these ambitions. Tuula Mattson, CSUN -- Graduate Educational Psychology, Finnish Heritage: Tuula says, ìMy ideal job would be working as a city college counselor. I love the intimate nature of a city college campus, and the fact that anyone can be accepted. I believe this is at the heart of what constitutes the 'American Dream.' This gives students a second chance at success. I have always been fascinated by other cultures, and feel fortunate to have had parents with such a rich background." Angela Mercer, CSUN -- Graduate Educational Psychology, Norwegian Heritage: Angela says, "Similar to the immigrants of today, my ancestors faced prejudice and ridicule. This was in addition to dealing with the loss of family, friends, and institutions. I wish to develop a multicultural training group for school-age children with the ultimate goal of increasing pride in oneís background and greater understanding of others." P2r Anders Sj-blom, Woodbury University -- Senior Architecture, Swedish Citizen: Professor Gerard Smulevich says of P2r, "A very dedicated and serious student of architecture, he possesses the maturity and passion for architecture that is the making of an excellent scholar and an outstanding professional. I can think of no one more meritorious and deserving of consideration for your well-regarded fellowship." Lisa Moon, Cal State Long Beach -- Senior Psychology, Danish Heritage: Lisa is recipient of many awards including the CSULB Outstanding Senior in Psychology Award. Dr. Virginia Binder, Professor of Psychology and Undergraduate advisor says of Lisa's work as a peer advisor, "I could relax when I saw that Lisa had been in charge of something. She is very thorough in everything she does. Furthermore, she is sensitive to students' need and those of her colleagues." Kristina Roxanne Roodsari, (Elli Nilsen Scholar designate), USC -- Senior Political Science (pre-law), Swedish-Iranian Heritage: "Whenever the term diversity or a comparison of diverse backgrounds is being discussed, I canít help but smile to myself. I always feel a little like a poker player holding a royal flush." A member of Vasa Jr. folk dance club and participant in a multitude of Swedish cultural activities Kristina has minored in International Relations at USC and is interested in the field of international law and/or children's rights advocacy as her career goal.